With the phenomenal growth of the LED lighting market, there has been a natural growth in demand for highly efficient and controlled LED drivers. Applications from ‘smart’ street lights, flashlights, digital signage and many others require not only highly regulated currents, but in many cases dimming capability in order to sustain the energy efficient scheme and end use flexibility behind LED design. As there are several ways to achieve dimming of an LED, we describe here the main methods that are used to provide dimming for LED’s from a switch mode LED driver. by a microcontroller as detailed in our product datasheets. The average current to the LED is the product of the total nominal current and the duty cycle of the dimming function. A designer must also take into consideration the delays in shutdown and start-up of the converter’s output which leads to limitations on the PWM dimming frequency and range of duty cycles. Analog dimming of the LEDs is the adjustment of the LED current level. This can be by resistive dimming or external DC control voltage. Since there is current level adjustment in analog dimming, inherently there is a disadvantage where color temperature variation can occur. The use of analog dimming is not recommended in applications where color of the LED is critical. Choosing the right dimming technique depends on your application and the performance metrics of that application. 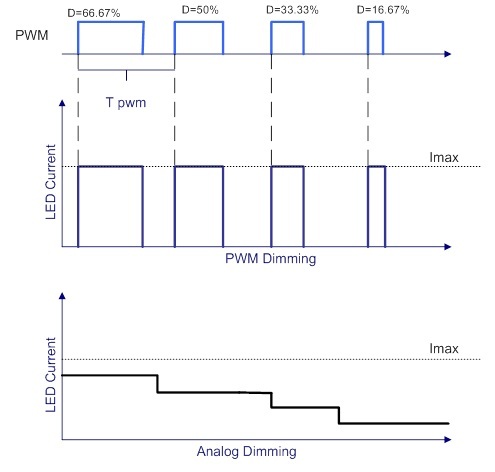 PWM dimming can be more complex and cost more but it has many advantages, as outlined above. However, a lower efficiency level is achieved while maintaining light chromaticity integrity. Alternatively, resistive dimming can be very effective and simple to perform and could be the better choice if the design can tolerate the possibility of color shift. Another positive aspect of resistive dimming is that there are no frequency issues associated with the design. Aimtec’s AC/DC LED Drivers are high performing IP68, IP67 and IP20 products with extended input range, active PFC, -40°C to +85°C operating temperature range and no load power requirement. They also allow for full dimming control using resistive (analog) dimming and thus can target all output current points. With output power up to 150W, they provide comprehensive solutions to target many applications from low to medium to high power applications. Aimtec’s AC/DC LED drivers offer several safety features that make them one of the best in class in the market. Aimtec’s DC/DC LED drivers (through hole and SMD package) have ultra wide input range and support PWM, as well analog dimming control. With the choice for dimming options, Aimtec’s LED drivers offer designers the dimming control options to optimize their application. Whether a designer is looking for steady color output dimming for color shift associated dimming, Aimtec’s DC/DC LED drivers allow designers to achieve their performance goals. With certain models having a unique pin for on/off control, these LED drives are designed to meet most application requirements in the market.